Guest speakers joined by Martha Amankwah, Webster Ghana director of Enrollment Management (second left), and campus director Christa Sanders (center). 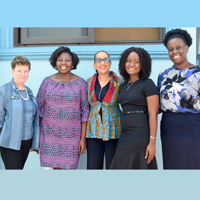 Webster University's campus in Accra, Ghana, recently hosted a guidance counselors workshop for high school counselors of high profile international schools throughout Accra. With a theme of “Effective Counseling for Achieving Academic Excellence,” the workshop attracted 24 guidance counselors representing 15 international and public high schools. Christa Sanders, Webster Ghana campus director, welcomed the counselors and shared recent developments of the Ghana campus over the academic year and future plans concerning enrollment, academics and facilities. Nancy Keteku, the Regional Educational Advising Coordinator for Africa, U.S. State Department, gave the keynote address. She has impressive career spanning 28 years of sending students from Sub-Saharan Africa to colleges and universities across the United States. Speaking to the counselors, she highlighted the critical role counselors, parents and students play in achieving academic excellence. Kelly Kwakye and Nana Adwoa Sey, alumni of the University of Pennsylvania and co-founders of K&A Educational Consulting, explored the "Do’s and Don’ts" of college selection. Charity Akotia, dean of the School of Social Science at University of Ghana - Legon, and Nancy Keteku (right) of the U.S. State Department's Regional Educational Advising Coordinator for Africa, U.S. State Department presented. Charity Akotia, dean of the School of Social Sciences, University of Ghana, Legon, and other members of the Webster faculty -- Richard Bunch (Management), Agnes Khoo-Dzisi (International Relations), Odolina Roussinov (Media Communications), and Bernard Okpattah (Computer Science) each spoke to the guidance counselors on the career opportunities within their various disciplines. Martha Amankwah, enrollment director at Webster Ghana, delivered the closing remarks and assured the counselors of Webster’s continued support and invited them to participate in future workshops and other programs that may also be of interest to prospective students. Feedback from the counselors was unanimously positive. The event was a platform for Webster University’s staff to interact with guidance counselors and strengthen existing relationships.